Egyptian Revival cufflink, circa 1890. For centuries artists and architects, mystics and jewelers have been inspired by the arts and artifacts of ancient Egypt. Cufflink and jewelry makers of the late 19th and early 20th centuries were no exception. The jewels they created often reflected the popular fascination with the mysteries and ruins of the venerable kingdom of the Pharaohs. Here is a sampling of Egyptian Revival cufflinks and jewels from the Victorian, Art Nouveau and Art Deco periods. In the Victorian era interest in the Egyptian past was sparked by archeological expeditions which highlighted ancient civilizations and the opening of the Suez Canal in 1869. The cufflink illustrated above is a striking, beautifully sculpted example of the prevailing Egypto-mania. Created by Sloan & Co. around 1890, the winged scarab appears ready to leap into flight with dramatic, upward sweeping wings and tightly sprung legs. A rich, antique finish gives the gold an aura of ancient splendors and the mysterious past. 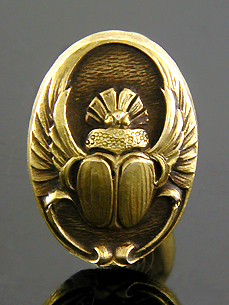 For the ancient Egyptians - and perhaps the late Victorians, as well - the scarab was a symbol of life and resurrection imbued with amuletic powers. 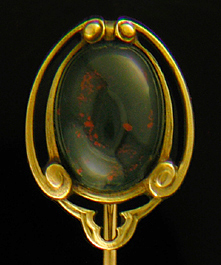 Krementz Art Nouveau cufflink, circa 1900. In the 1890s Art Nouveau jewelers wedded a strong personal vision with a sense of mysticism and fantasy to create jewels of unbridled imagination. They turned away from the revival styles of earlier decades in an effort to create something new. And, yet, the fascination with the Egyptian past persisted. Krementz & Company was one of the early proponents of Art Nouveau design in North America. The above Krementz cufflink brings together the exoticism and sinuous curves of the new fashion with an elaborate headdress and ostrich feather plumes suggestive of the splendor of the Pharaohs. During this period Sarah Bernhardt captured the public imagination with dramatic roles as Cleopatra and other heroines and heroes of myth and history. Costumed in the jewels of Rene Lalique and celebrated in the posters of Alphonse Mucha, the French actress was both a patron and muse to the Art Nouveau. Perhaps the exotic design of these cufflinks was inspired in part by the actress lauded as "The Divine Sarah". WAB Egyptian Revival cufflinks in 14kt gold, circa 1920. As the figural designs of the late Victorian and Art Nouveau periods evolved into the abstract, geometric designs of the Art Deco era, the discovery of King Tut's tomb sparked a renewed interest in the Egyptian past. The stylized motifs and geometric designs of the ancient Egyptians spoke to Art Deco jewelers, designers and architects. The above cufflink created by Wordley, Allsopp & Bliss (WAB) illustrates the Art Deco take on Egyptian Revival. Stylized papyrus fronds and lotus blossoms in an abstract cruciform design are surrounded by jazzy, zigzag borders along the beveled edges of the cufflinks. WAB was a leading cufflink maker of the Art Deco era and excelled at creating jewels that captured the spirit and elegance of the age - both the ancient and the modern. The fascination with the Egyptian past was expressed in many forms of jewelry and decorative objects. Here we illustrate a Victorian pin with a winged scarab flanked by two green-eyed peacocks and a stickpin created by Hans Brassler of a stylized scarab set with a richly colored bloodstone. Recent additions to the Antique Cufflinks Gallery include elegant British cufflinks set with blue and white enamels in rose gold and a striking pair of Art Deco cufflinks by the "TH" mystery maker. Blue and White Elegant British cufflinks enlivened with blue and white enamels set in radiating frames of rose gold. The warm tone of the rose gold beautifully complements the rich, vibrant colors of the enamels. Crafted in 9kt rose gold, circa 1950. Art Deco Elegance Stylized water lilies and waving grasses surround centers engraved with a pattern evocative of ripples on a wind blown pond. A nice example of the wonderfully detailed, beautifully designed cufflinks of the Art Deco era. Crafted in 14kt gold, circa 1920.